Five weeks into our six week block of our Monday Night Summer Sessions, we can say that it has been a success from start to finish. We advertised this session in local schools via K:A Leisure with the aim to attract new beginners into our club and give locals a chance to play table tennis during the summer under qualified coaches and in a friendly enviroment. We have had over 20 new players attending our club due to the promotion of this session and it looks like the majority will be here to stay through-out the season. After 5 weeks of playing away, they have got the “table tennis bug”. 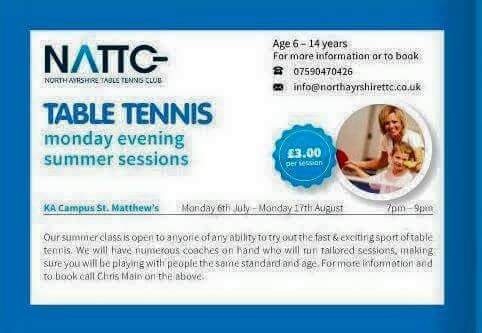 Monday Night TT has got an open door policy where we welcome anyone from any background or age to come along and get involved in table tennis. This has been the busiest summer of our history with more than 40 players attending on Monday evenings plus all the other sessions we run during the week. We allocate tables and make sure that everyone has someone to play against that is a similar level and age.